Join the discussion on our forums! 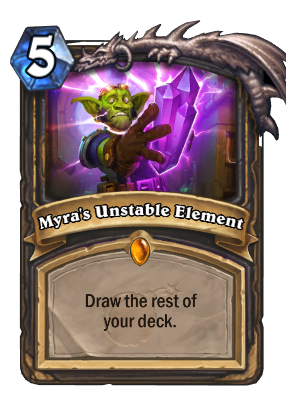 Come discuss Myra's Unstable Element over in our dedicated Myra's Unstable Element discussion topic. If you want to win on turn one play Coin -> Preparation -> Myra's Unstable Element. Your opponent will be so awed that they automatically concede to your power. "To save you pesky rogues the trouble, we figured we would just fit gadgetzan auctioneer, preparation and 20 other spells all into one card!" Funny thing happened today in wild : Yogg-Saron, Hope's End cast Treachery on itself and then cast Myra's Unstable Element, followed by Cataclysm. That's insane! Put an apple on his head! This is in my odd rogue i use it for my "last ditch kamikaze!" to push damage saved me a few times! it's basically an "all in card". Picked... 100% of time in Arena??? Rogue's heyday of milling others ended the day Coldlight Oracle rotated to wild. Don't do it Valeera, you still have a future, don't - ok, she just milled herself. This card actually doesn't draw all your deck, the card text lies. What it truly does is drawing cards until your hand is full, and THEN destroying the remainder of your deck. It can make quite a big difference sometimes, for example with Fal'dorei Strider. Sort of the same thing, because when you draw a card whenever your hand is full, the card is burned/destroyed. So spiders don't spawn if you sprint when you have 10 cards. Same effect. It's a simpler text that is mechically identifical to what you suggest. That whole 2 second animation! This opens up room for a lot of awesome deck archetypes. Gonna love tinkering with Rogue in this set! I think begginers worry 2 much about milling themselves. Sometimes you don't care about milling at all like when you're playing an aggro deck and you're running out of steam. You need to win in the next 2-3 turns anyways. Also you can shuffle spiders and copy faldorei strider with lab recruiter. Busted broken card, easy 5 star. This seems pretty good after the release of both Lab Recruiter and Academic Espionage. Looking forward to trying this card out!